It is becoming scarier daily in this part of the world as the government that promised to fight corruption are now specialists in bribing their way through whatever they want. 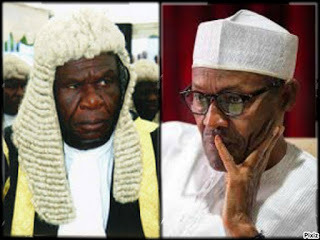 I wrote two different articles a few days ago on the bribing of journalists and the inconsistency in some judge's rulings, using Justice Tsoho as a case study. Little did I know those were just preambles. Buhari just launched the introduction proper by offering bribes to Ekiti law makers to impeach governor Ayodele Fayose, for criticizing and countering his evil government. The Ekiti State lawmakers and top government functionaries arrested by Buhari's DSS on Tuesday, the 8th of March alleged that they were offered a sum of $1million to impeach the governor, Ayodele Fayose. 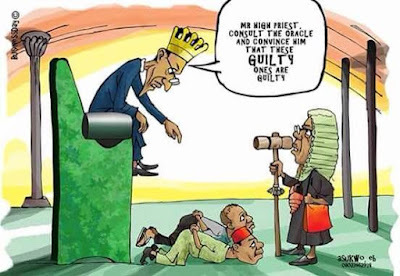 The lawmakers stated that they are rather willing to spend the rest of their tenure or even life in DSS cell instead of teaming with the evil Buhari and his cohorts in this evil plot. They vowed never to have their hands stained with such grave evil against an innocent man whose only offence is speaking the mind of the suffering masses. During a press conference today, the Chairman, House Committee on Information, Hon. Gboyega Aribisogan, disclosed that eight lawmakers had been visited by officials of the DSS and made financial inducement if they agree to the agenda. What does Buhari understand "corruption" to mean? Is this not a good evidence to show that he has only been unleashing political vendetta rather than fight corruption so far? Can corruption fight corruption? With the bribing, disobedience to court orders, dictatorship, killing innocent citizens with the military, and jailing those who criticise these actions against their fundamental rights, I am forced to ask; What's going on? Which way is the zoo headed? Biafra is all we ask for.